Please help us ensure our park is a special and unique place in this neighborhood. Your contributions are tax deductible. Don’t forget to ask your company if they would match your donation. We are park partners with the San Francisco Parks Alliance, our fiscal sponsor and a 501(C) 3 organization. this link will take you to the San Francisco Parks Alliance online donation page for Upper Noe Recreation Center. Fill in the simple form and you will be sent a confirmation. Thank you for your interest in supporting the Noe Valley Rec Center. We appreciate your help! 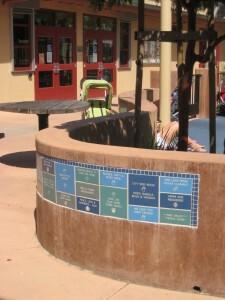 Thank you to all those who purchased the tiles that were installed in 2008. The wall looks beautiful and shows what amazing community support we have. Should we plan a second round of tiles in another location? Please email the FNVRC Steering Committee at info@noevalleyreccenter.com to express your interest or opinions.